Yankee Sheet Cake?! 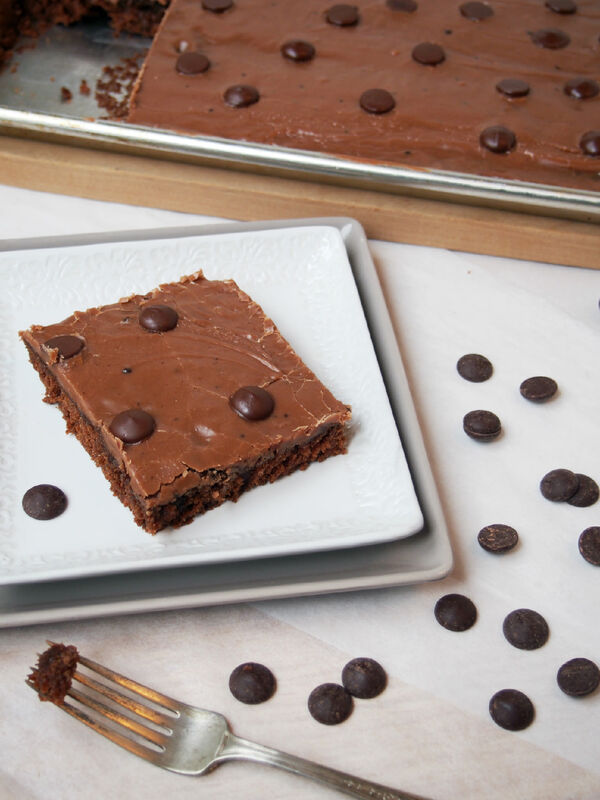 Think of it as a kissing cousin to Texas Sheet Cake, which is a beautifully moist, thin chocolate cake with a rich chocolate glaze. I have been to Texas several times in my life, and not one time did I eat anything called a Texas Sheet Cake. I’m not sure, but I think the name may come from the fact that the cake is quite large. As big as Texas, perhaps? I did, however, make a Texas Sheet Cake for my Bacon Slayer when we were first married. The cake was was big, and beautiful, and oh so moist. Now my recollection may be a bit foggy, but we may or may not have eaten half of that cake in one sitting. Or maybe the dogs got into it. When in doubt, blame the dogs. As much as we loved that cake, I didn’t make another one for about 10 years. My tastes had evolved a bit since the first time, so I made about 17 different versions of it until I came up with one that I loved. I mean it. I love this sheet cake! I adore this sheet cake! And being that I have lived my entire life north of the Mason-Dixon line, I see it only fitting that this cake be named Yankee Sheet Cake, for a Yankee, I am. I put in a few ingredients that you may not expect to see in a chocolate cake, but trust me when I tell you–it works. The resulting cake finishes beautifully. People will love it, and wonder what makes it so special. The best part is that it is SO easy to make! 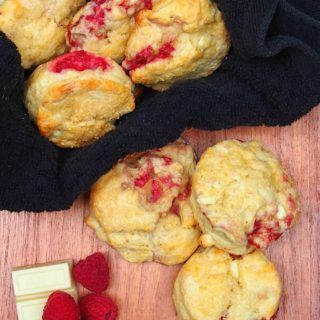 Take a leap, and follow the recipe as written–you’ll be glad that you did. If not, I’ll eat your cake. 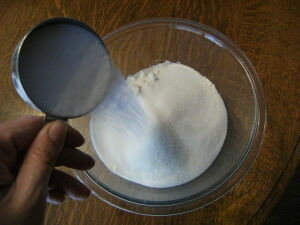 Spray a half sheet pan, or a 15 x 9 x 2 jelly roll pan with floured baking spray, or grease and lightly flour the pan. And since I don’t sift anything–ever–give it a whisk to combine them, and set the bowl aside. 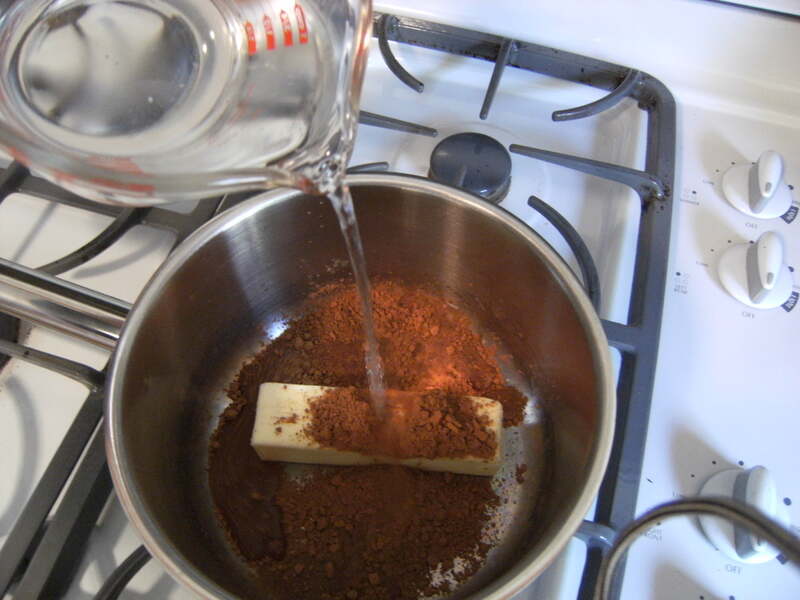 Put a stick of butter, cocoa powder and water into a large saucepan. This cake is made entirely on the stove–no mixer required! I even was the saucepan when the cake is in the oven and use the same pan to make the frosting. I’m organized like that. Actually, I hate washing dishes, so I figure if I wash the pan and use it again, than I’m not dirtying as many dishes. Wait. What?! It sounds much more logical in my head–trust me. 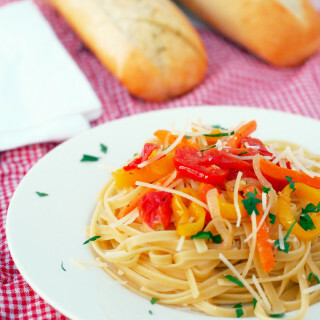 Hmmm…I’m asking you to trust me a lot in this recipe, eh? 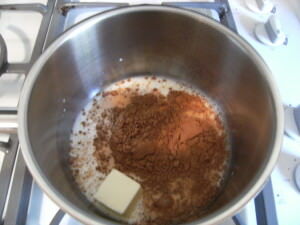 Heat the butter/cocoa powder/water over meduim heat, whisking to combine as the butter melts. Let it come to just boiling, and turn off the heat. Don’t let it continue to boil. Bad things happen to butter if it is allowed to boil away on the stove. 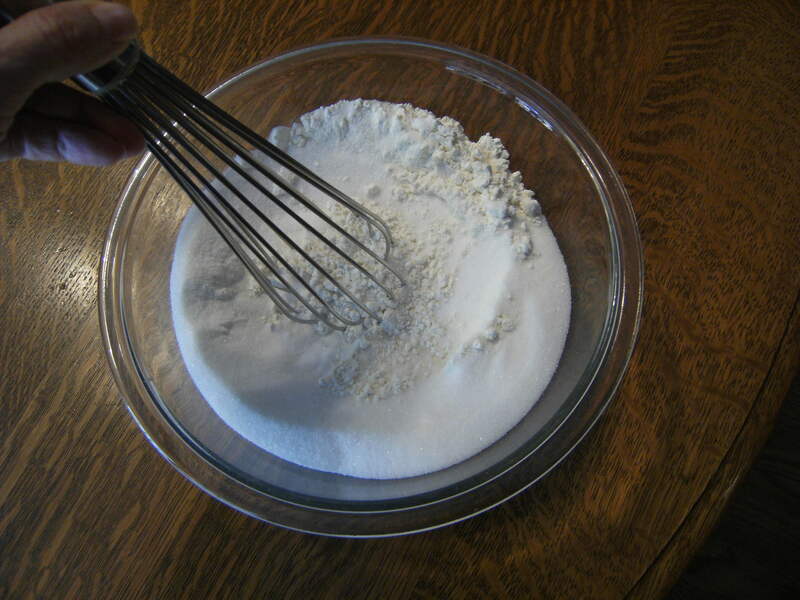 Whisk in the flour mixture, until combined. 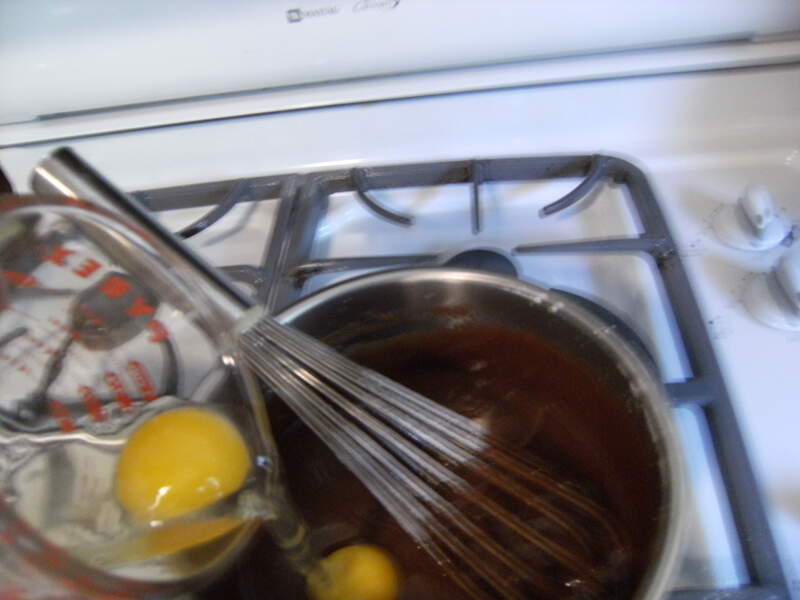 Whisk in the eggs, one at a time, until well incorporated. I like to crack however-many-number-of-eggs that I need for a recipe into a measuring cup before adding them. Then I “pour” the eggs until a yolk falls in, whisk it together, and repeat until all of the eggs are worked in. I find this helps keep rogue bits of shell from jumping in to your baked goods. Believe me when I tell you that biting on a rogue bit of eggshell can ruin your day. Stir in vanilla, buttermilk, baking soda, salt, cinnamon and cayenne pepper. Yes, I said cayenne pepper. This super-secret ingredient makes all the difference. If you don’t have cayenne pepper, you can substitute chili powder, but cayenne is really the best. I promise you that I haven’t totally lost my mind. The bit of heat mixes with the chocolaty goodness, and does a little dance in your mouth. It’s not hot or spicy or weird tasting. It’s just perfect. 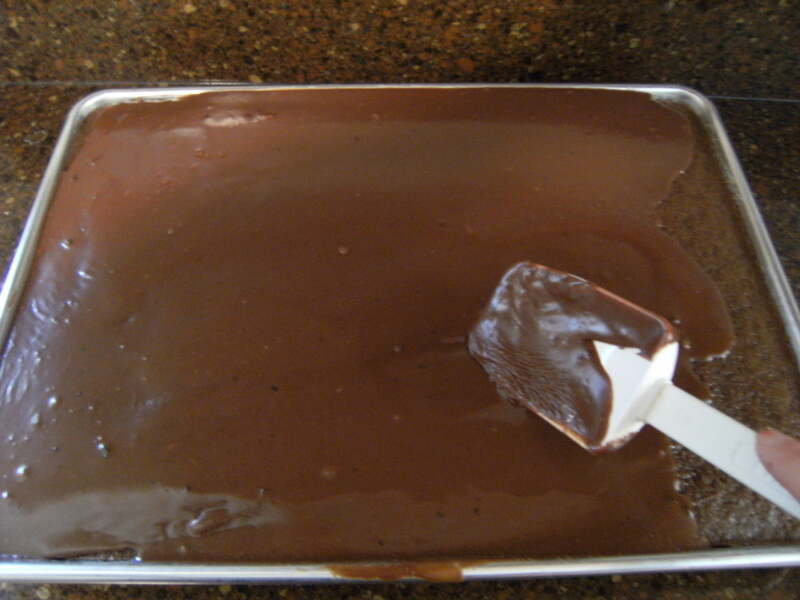 Pour the cake batter into you prepared pan, and bake in a 350 degree oven for 21-24 minutes or until a toothpick inserted into center of the cake comes out clean. While you are waiting for the cake to bake, make your frosting! 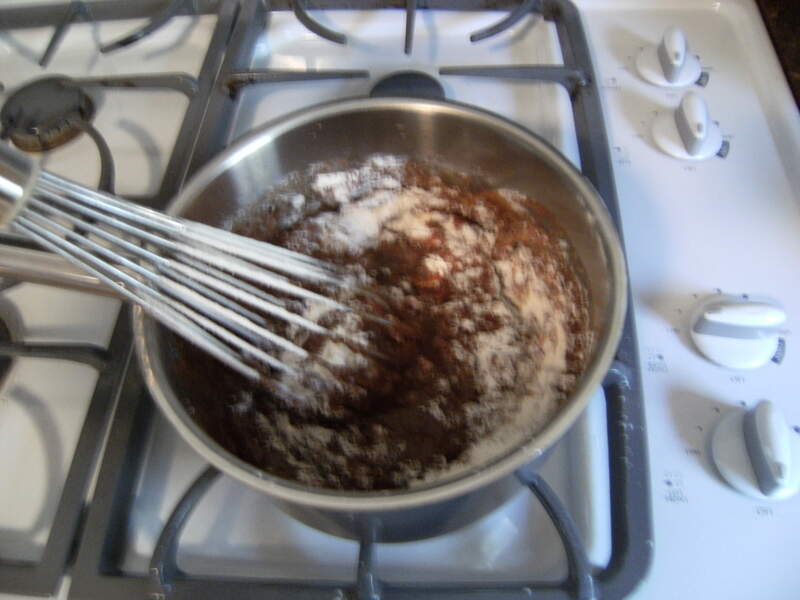 Be proactive and wash the pot you used for the cake, and use it for the frosting. Whisk milk, cocoa powder in a saucepan until combined. Add butter and heat over medium heat, until butter is melted, stirring occasionally to combine. Remove from heat, and stir in the vanilla. 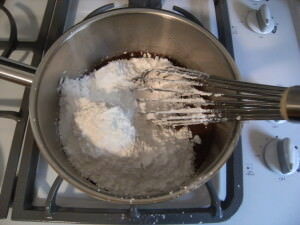 Add the powdered sugar, and whisk it together until the frosting is smooth. You are going to have buff forearms when you are done making this cake. You have my permission to skip your workout for today. Set the frosting aside until the cake is done, and cooled for no more than 10 minutes on a wire rack. 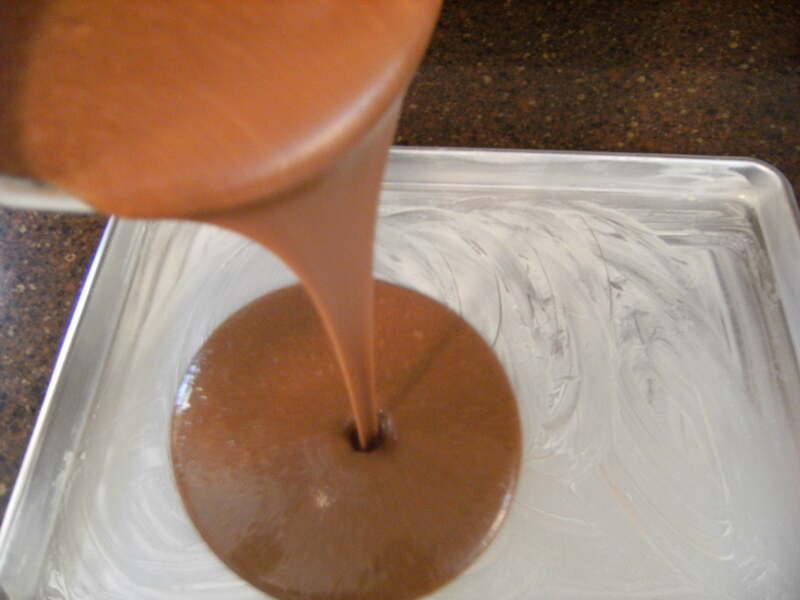 Pour the frosting over the warm sheet cake. I love this part–no waiting for the cake to cool before you frost it! Lightly spread the frosting to the edges of the cake. Be gentle here. This is a very moist cake, so if you use a heavy hand to spread the frosting, you are liable to tear up the cake. That would be tragic. See how shiny the frosting is? I love shiny things. Now, a traditional Texas sheet cake usually calls for mixing pecans or some other nut into the icing. Nuts are a no-no in our house, so my cake is nut-free. Scatter a few extra chocolate chips over the icing if you think you’ll miss the crunch provided from the nuts. If you’re like me, you won’t be able to wait for the cake to cool completely, so you’ll cut a little sliver out of the corner to taste it. No one will ever notice. 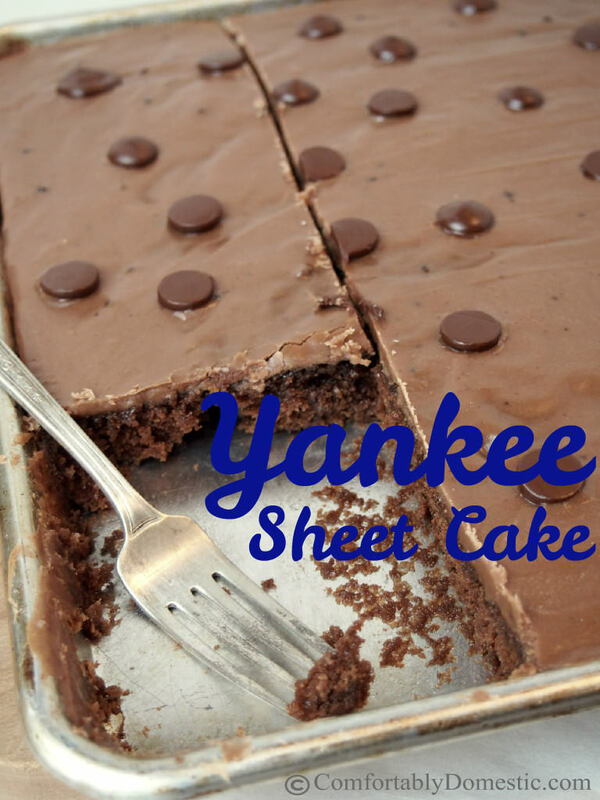 I hope you love this Yankee sheet cake recipe! In a small bowl, combine flour and sugar and set aside. 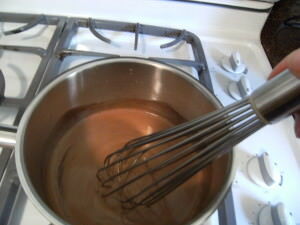 In a 3 quart sauce pan, heat water, butter and cocoa powder over medium heat; bring to a boil while whisking to combine. Remove from heat. 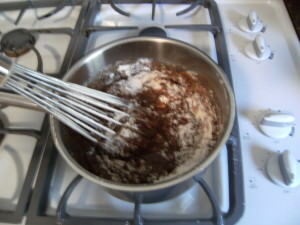 Stir in vanilla, buttermilk, baking soda, salt, cinnamon and cayenne pepper; mix well. Pour into prepared pan. Bake for 21-24 minutes or until a toothpick inserted into center of the cake comes out clean. Remove from oven and cool on a wire rack for 10 minutes before frosting. The cake must be warm when frosted! Whisk milk, cocoa powder in a small saucepan until combined. 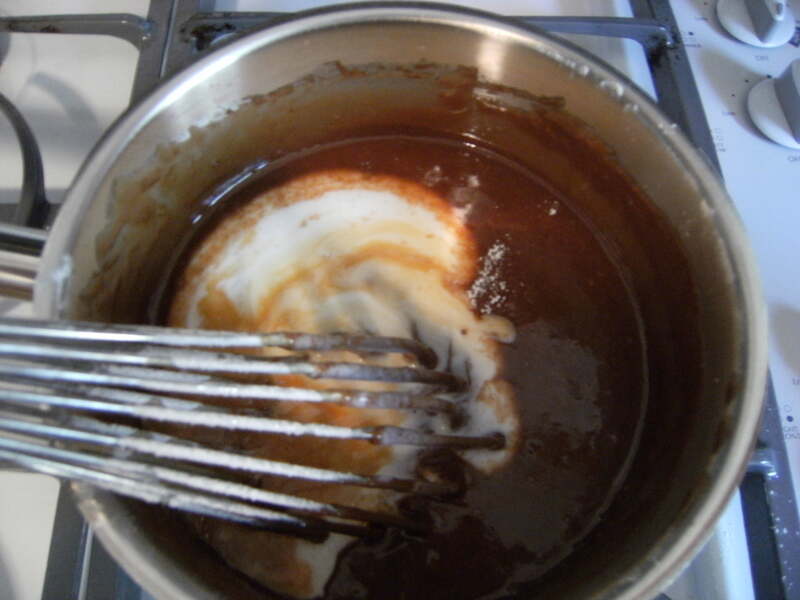 Add butter and heat over medium heat, until butter is melted, stirring occasionally to combine. 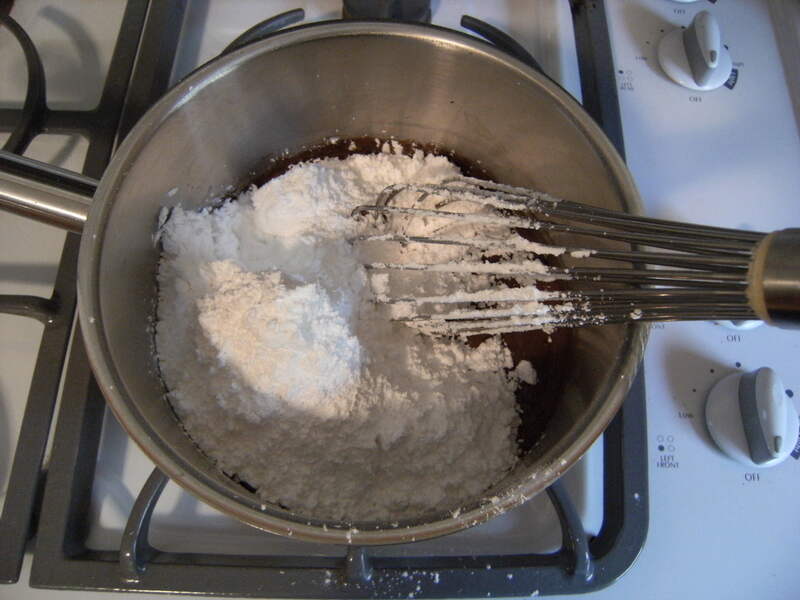 Whisk in powdered sugar and stir until frosting is smooth. 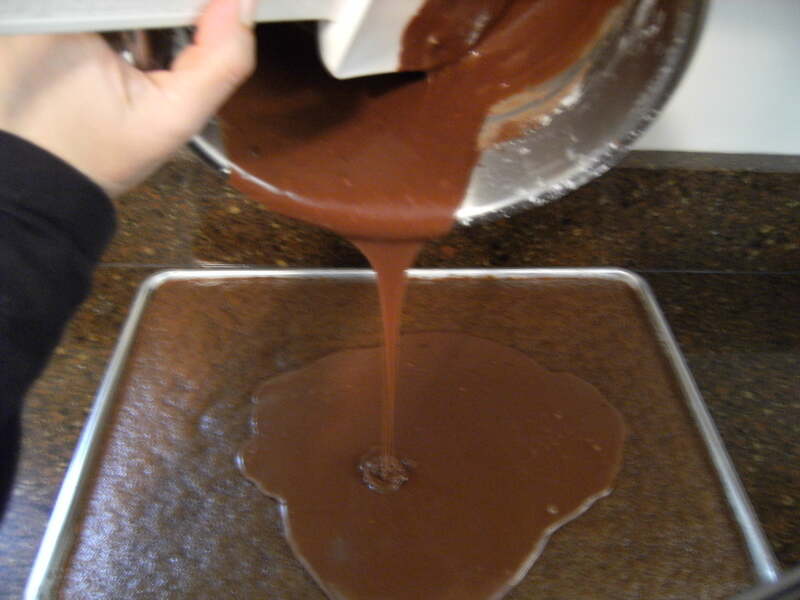 Pour frosting over warm cake, and spread evenly with a knife or a spreader. Cool completely and cut into squares to serve.